The Hague Humanity Hub and ImpactCity warmly invite you to the Masterclass on the Basic Principles of Social Entrepreneurship with John Marks. John Marks is a social entrepreneur who founded Search for Common Ground and headed it for 32 years. Together with Susan Collin Marks, his wife and SFCG’s Executive Vice President, he developed it into the largest peacebuilding NGO in the world with 600 staff members and offices in 35 countries. The organisation has been nominated for the 2018 Nobel Peace Prize. On July 9 at The Hague Humanity Hub, John will lead an interactive workshop in which he describes the basic operating principles that he has found underlie successful social entrepreneurship. The workshop will provide a practical framework for the next generation of social entrepreneurs, starting from vision and moving into effective action. The ideas presented will draw from John’s extensive experience, as well as from the wisdom of participants. The goal will be to lead participants through the possibilities that abound when they grasp their inner potential to make a difference and to carry out the work that the world so badly needs. This workshop is designed for professionals, social entrepreneurs, startups, as well as students active or interested in the field of peacebuilding. This event will be followed by networking drinks. First drink is on the house. 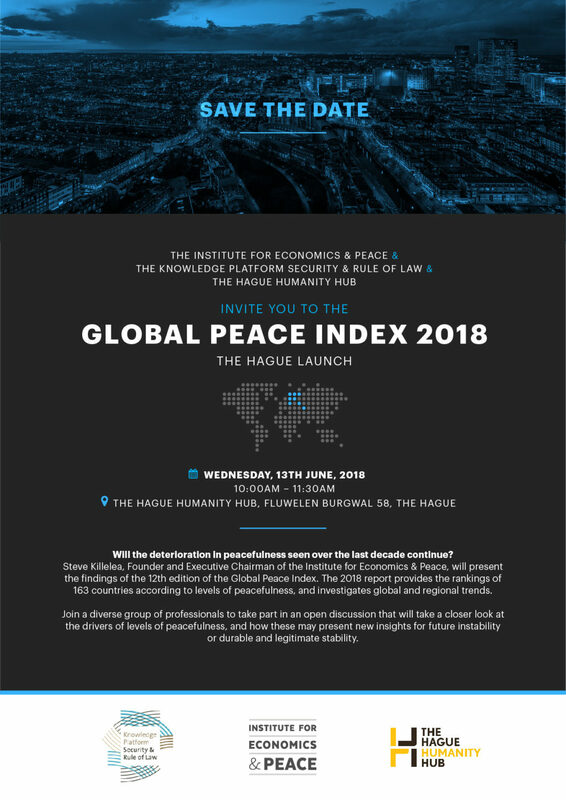 The Institute for Economics & Peace, The Knowledge Platform Security & Rule of Law, and The Hague Humanity Hub invite you to the Global Peace Index 2018 The Hague Launch. Steve Killelea, Founder and Executive Chairman of the Institute for Economics & Peace, will present the findings of the 12th edition of the Global Peace Index (GPI), the world’s leading measure of global peacefulness. This report presents the most comprehensive data-driven analysis to-date on trends in peace, its economic value, and how to develop peaceful societies. – What are the links with the sustaining peace and sustainable development agenda’s and what impact do the findings have on these agenda’s? – The Dutch Government prioritizes “legitimate stability” as an objective of development interventions in fragile states. What are the focus areas for interventions that the GPI highlights? – What conditions are imperative for peaceful and stable lives, and where can Civil Society Organizations contribute to meeting those needs? – How should we interpret future changes in peacefulness in light of the new Dutch Foreign Trade and Development Cooperation agenda titled “Investeren in Perspectief”? – What new partnerships can be developed for building peace in the future and how can data from the GPI serve their goals? Please note there are limited seats available. Coffee and tea will be provided. We are celebrating! Our grand opening will be on 15 March. Connect to and possibly join our community of innovators in peace, justice and humanitarian action during an afternoon of inspiration and co-creation. You can find all the program info and register for a free ticket here. We have limited capacity, so don’t wait and secure your spot now! Try the Community Risk Assessment (CRA) Toolbox, currently being developed by 510 (Datateam of the Netherlands Red Cross), which enables insight in both the current as well as the future nutrition status of target areas, yourself. At the first edition of the monthly Third Thursday Meetup organized by DCHI at the Hague Humanity Hub we delve into The Community Risk Assessment and Prioritization toolbox that collates open data on a set of vulnerability- and coping capacity indicators. When this is combined with hazard and exposure data, priority areas for humanitarian intervention can be identified faster. The Toolbox is a.o. based on joint research carried out by ICCO and 510 (Datateam of the Netherlands Red Cross) and collaboration with Sight and Life and DSM. You are invited to try the CRA tool yourself to see how it can be used in practice and to support the team in discussing the possible next steps. Bringing a laptop can be useful for this, but is not mandatory. Join us for drinks after the meetup! You can register here.